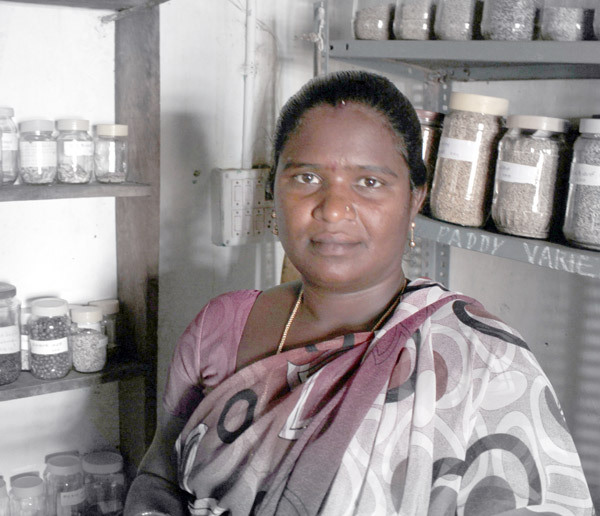 When Nagrathanmma first became associated with GREEN, she says, very few people in her village of Kulumedoddi knew anything about indigenous seed varieties. In fact, nearly all of 50-odd families in her community were cultivating hybrid seeds through extensive use of chemicals, often incurring debt to meet the expenses of farming. So when she heard of the principles and practices of sustainable agriculture through GREEN, Nagrathnamma felt from the very beginning, that it would greatly benefit her friends and neighbours. She soon decided to champion the cause of sustainable agriculture and became, in many ways, an influencing force in her community. GREEN’s approach is one of a collaborative and participatory process that works together with community members like Nagrathnamma to bring about effective change at a grassroots level. “GREEN gave us a lot of training on sustainable practices and took us on exposure visits to different places to show us how other farmers were doing this,” she says. Training sessions empower and enable farmers in the preparation of organic inputs and teach them sustainable practices, such as the SRI method for dry-land paddy cultivation, which help ensure good yields. These trainings are particularly essential in the capacity building of women farmers, who gain a great deal of personal self confidence through the exposure they receive. Empowered through various intervention initiatives, Nagrathnamma then began to disseminate this knowledge to her friends and neighbours, working with GREEN as an animator. She soon discovered, however, that persuading people to give up the cultivation of hybrid varieties was no easy task. This is one of the biggest hurdles that GREEN faces in its work: farmers are often set in their belief that yields will reduce drastically and income will be severely affected if they switch to indigenous varieties and sustainable practices. “We wanted farmers to try the SRI method, but there was little interest from people,” says the enterprising mother of two. After a lot of persuasion, 3 women farmers in the village agreed to try and cultivate some ragi (millet) and paddy varieties provided by GREEN in small sections of their land. With a sum total of just ¼ acre of land, these women farmers took their first steps towards a more sustainable future. People were so sure that there would be no benefits from this type of agriculture, that even the 3 women farmers who had given their land for experimentation provided little help. However, it is during times of adversity that the real benefit of any new initiative is tested, and this was the case in Kulumedoddi. When a transformer in the village broke down and the electricity supply to village water pumps was cut off, many of the hybrid crops being cultivated were severely damaged due to the ensuing water problem. Farmers suffered because of the drastic decline in yields, but the one observation everyone made was how well the indigenous varieties thrived despite the sudden water problem. “That’s how people realized the advantages of these indigenous varieties,” says Nagrathnamma. That realization took nearly 2 years in the making. In the early years, a Community Seed Bank was established in Kulumedoddi through GREEN’s initiation. Here again, women farmers played a crucial role. Traditionally in Indian agriculture, it is the women who are responsible for seed management activities. But as Nagrathamma says, very few farming families undertook these activities in the early years of GREEN’s intervention. Traditional seed conservation processes had fallen out of use in the community as more and more farmers took up the cultivation of hybrid seeds; these seeds cannot be saved from year to year for sowing. The Devaralamma Samudhaya Community Seed Bank provided a platform for the reintroduction of seed conservation activities in Kulumedoddi. Soon, the CSB became a very important part of the community. Before its establishment, says Nagrathnamma, farmers had to wait in long queues to buy seeds. At times, supply could not meet demand and farmers would be without seeds during the crucial period of sowing. And when seeds did become available, rains would not coincide. “Everything starts with the seed. It is a tragedy if even one farmer cannot get seeds during sowing season. The seed bank gives them free access to seeds when they need it most,” she says. The CSB also provided a platform through which the message of sustainable practices could be spread throughout the community. Fellow CSB member Lakshmamma says it was only after she joined the seed bank that she started to cut down on the use of chemical fertilizers. As awareness in the village increased, more farmers came forward to request indigenous seeds from the seed bank. But even then, there were challenges to be overcome. “In a seed bank, farmers must return twice the amount of seeds they borrow. But the seeds they used to give us back after harvesting were of very poor quality. We had to explain to them that we would distribute their seeds to other farmers just like them, and it was important that the quality was good.” GREEN also trains CSB members in proper storage techniques, seed cleaning methods, proper record maintenance of seed transactions etc. to ensure the efficient and smooth functioning of the seed bank. The gradual influence of the seed bank brought about many changes within the village. The re-introduction of indigenous crop varieties that had been lost in the community increased their cultivation by farmers. These varieties, says Nagrathnamma, respond well to low cost organic inputs that can be prepared at home. Fellow CSB member Lakshmamma says it was only after she joined the seed bank that she started to cut down on the use of chemical fertilizers. With continued intervention, adds Naagrathnamma, village members themselves started to come forward for training sessions provided by GREEN. They began to realize the advantages of low cost, organic inputs. “Our input costs have reduced by around 50% since we started using these practices,” says Narasimaiah, fellow village member. Regular meetings at the Community Seed Bank were also beneficial as they gave farmers an opportunity to discuss problems and find solutions to their concerns. This was especially useful for women farmers, says Nagrathnamma, who face many challenges in the agrarian world. According to her, a good majority of all work, including sowing and harvesting is done by women. “If a woman who has to go to work in the fields everyday needs spending money, it’s not easy for her to get it. She has to ask her husband and he may not have any. If her children need money for a class trip, she may not be able to send them,” she adds. There are many other changes that Nagrathnamma has witnessed since she began working with GREEN more than 4 years ago. Of the 50 homes in the village of Kulumedoddi, 40 are now cultivating indigenous seed varieties and incorporated sustainable practices in their farm management she says. Eighteen farmers have signed up for organic certification through the Participatory Guarantee System (PGS). PGS employs a group-approach of peer appraisals to provide quality assurance for consumers and buyers of organic produce. Initiated with an aim to increase the economic returns of organic farming, it is an economically viable option for small scale and marginal farmers who cannot meet the costs of expensive organic farming certification. This significant tide of change is being felt not only in her own village, but in the surrounding villages too. The Deveralamma Community Seed Bank now supplies seeds to more than 7 villages and farmers in Kulumedoddi have taken up seed production to meet this demand. This seed production has become alternate source of income for the farming families, thereby strengthening their economic security. Seed procurement is done through Janadhanya, the farmer’s society initiated by GREEN.